Actual windtunnel photographs show that wing surface-length is irrelevant. Pulsed smoke streams illustrate that the air flowing above the wing is greatly outracing the air flowing below. Parcels of air which are divided by the leading edge DO NOT recombine at the trailing edge. Therefore the "equal transit time" explanation ("wing shape" explanation) of lifting force falls apart. The above flim clip of a windtunnel experiment depicts a single "plane" of smoky air as it approaches a thin airfoil and is sliced into upper and lower portions. Note that this airfoil is NOT "curved above and flat below." Instead the upper and lower surfaces are approximately equal in length. Note that the air flowing above the wing quickly outraces the air flowing below. The air flowing above and below the wing never rejoin again. The real reason for the rapid flow of air above the wing is never explained in textbooks using the "wing shape" explanation of lift. The confusing aspects of "airfoil shape" shown above can totally obscure the true nature of aerodynamic lift. Many authors point out that asymmetrical airfoils give positive lift even if the angle of attack is zero. They offer this in order to prove that "wing shape", and not "attack angle" should be the explanation of choice. But there is a problem here. To determine if an airfoil is tilted, we cannot rely on construction of the geometrical attack angle. Geometrical attack angle is very sensitive to tiny bumps on the wing's leading edge, since tiny bumps can change where we draw the main 'chord.' Yet tiny bumps on the leading edge can have little effect on deflection of air, while the tilting of the airfoil shown in the fourth section can have an enormous effect upon the deflection of air and upon lifting force. "Kutta Condition" shows that the angle of the trailing edge is critical to production of lifting force. SMALL FEATURES ON THE LEADING EDGE CAN CAUSE US TO TILT THE ENTIRE WING, WHILE WE DENY THAT WE HAVE DONE SO. To determine the effective attack angle, we cannot trust the simple geometrical rules. To determine whether an asymmetrical wing is REALLY set to zero angle of attack, we instead must take seriously the concept of "Kutta condition," and inspect the trailing edge of the airfoil to see if it directs the air downwards. Or put simply: the angle of the trailing edge IS the angle of attack, and the angle made by the main chord of the airfoil has little effect on the lifting force. The above fluid simulation from Saab Aircraft shows phase lag between upper and lower air parcels after an airfoil has passed. Air travels much faster over the top of the airfoil, and then it never rejoins the air which has travelled below. Note that the airfoil has deflected the air downwards. The above air flow simulation is from J. S. Denker's SEE HOW IT FLYS, in the Airfoils chapter. Note that the asymmetrical (cambered) wing at the top of the diagram has been adjusted to produce zero lifting force. There is no "slip" or "phase delay" between upper and lower airflows. In the middle and bottom diagrams, the angle of attack is progressively increased, which also creates an increasing lifting force. The increasing angle of attack also increases the phase delay between upper and lower air flows. So not only is the common "wing shape" or "path length" explanation wrong, but it even conceals some of the most interesting phenomena in airfoil physics: the fact that the time delay between upper and lower airflows is proportional to the attack angle and the lifting force! Prof Klaus Weltner notes that in the famous publication in NACA report 116, Prandtl may have become the origin of the "Transit-Time Fallacy." Prandtl depicts a lack of circulation in a flow diagram producing significant lift. The roughly vertical lines in this diagram are incorrect, and only show the flow for a zero-lift condition. Yet the rest of the diagram depicts "Kutta Condition" and strong lift. 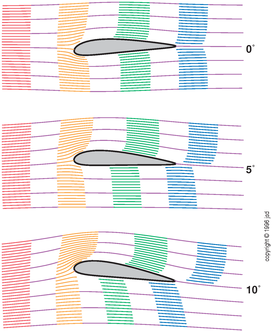 Those vertical lines instead should be drawn to show an enormous offset or "phase delay:" where the upper parcels vastly outrace the lower parcels, and never meet up after passing the trailing edge of the airfoil.